Key features are set to include a new optical track pad to ease navigation, a 3.2 Mega pixel camera with video recording, HSDPA and Wi-Fi internet, up to 32GB of expandable memory, and the ability to sync you phone with your iTunes account. The smartphone you’ve all been waiting for – and by ‘you’, I mean ‘me’ – has been given a launch date of June 25th on the Canadian network Rogers. Apple’s launch of the iPhone 3G yesterday heralded a new change in direction for the company, towards a more business-friendly approach. 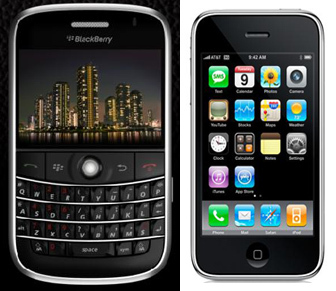 BlackBerry is predominantly the business user’s handset manufacturer of choice, with their first 3G model, the Bold 9000, squaring up nicely to the iPhone. Take a look at the below comparison of specs between the two models, and let us know in the comments field below which you’d prefer. BlackBerry Bold 9000: 127mm in length, 66mm wide and 12.7mm thick, it weighs 133g. 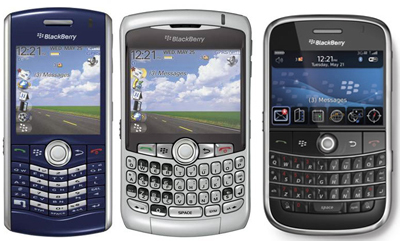 BlackBerry Bold 9000: 480 x 320 resolution, touch display. 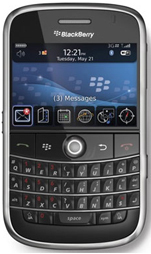 The BlackBerry 9000 was officially announced by Research In Motion this morning, and within minutes I was on the phone to my mobile contract provider, arranging the return of the Pearl 8110 I’d just ordered. Even though the 9000 won’t be out until Summer, it’s still worth waiting for, in my opinion.